It wasn’t long ago that I was working part-time at Trader Joes and my husband Silas was working soul-sucking corporate jobs. It felt like we were swimming upstream. Not knowing when the car would next break down again, and wondering if we’d even have enough money to pay the next bill. My husband was working CRAZY hours. But we just couldn’t seem to generate enough cash no matter how frugal we were. Fast forward 4 years later and we’re in a totally different place. How? In short, the internet, side hustles, and passive income. The internet is a powerful tool. Before the internet came along, side hustle ideas were harder to come by, but these days, narrowing down a list to only 40 ways to make $100 a day is hard! There are just that many ways to make money on the side because of the birth of the internet! Silas and I totally believe that making extra money on the side can change your life for the better. Only once we started to focus on ways to make extra income did we start to see some real financial progress. It helped my husband leave that soul-sucking corporate job. It stopped us scraping by and living paycheck to paycheck. It assisted us in paying off all our debts and reaching financial freedom. It enabled us to dream positively again about our future. It meant we could travel the world full-time while working for ourselves. Sure, we could have listened to the doubts in our minds or the naysayers who said it could never happen, but once we started thinking creatively, doors began to fling open. Once that happened, we couldn’t go back to working 9-5, coming home exhausted just to crash out in front of the TV. We realized there were SO many opportunities to make money—and it didn’t even have to be difficult! Seriously, you could be a student at college and still make some good extra cash using these tips we’ll lay out for you below. So need to find some extra ways to make ends meet? Or just wanting to make some extra cash fast? We’re happy to provide our experience and help you with that. 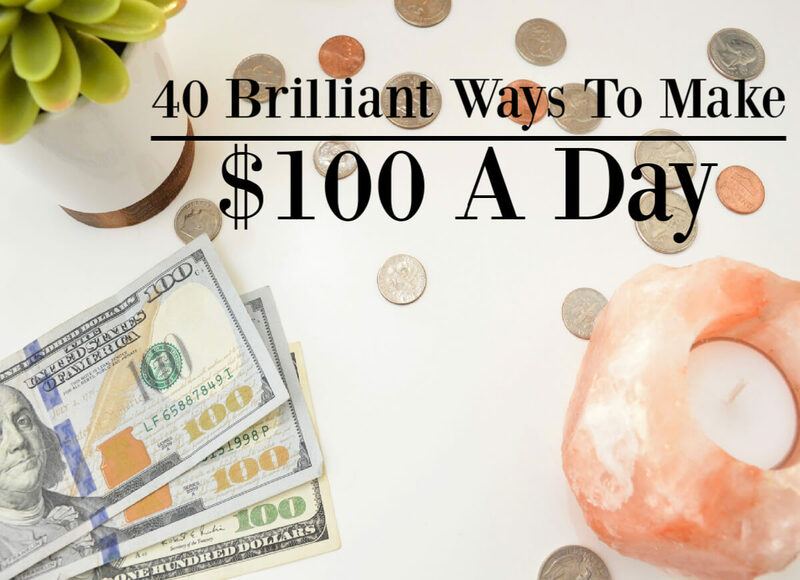 Check out these 40 brilliantly simple ways to make $100 a day. You may actually need to combine a few together to earn $100 in one day, but give them a read and let us know what you think of them in the comments section below! Make money by doing others’ errands? Yes! There are lots of opportunities through apps like DoorDash where you can deliver groceries and run people’s errands for them and cash in! Since most Dashers drive, you must be 18 or over, hold a clean driver’s record (i.e. no DUI’s or driving charges), and pass a background check. Once you start driving you must have car insurance. You can expect to earn about $10 per hour as a newbie still learning the ropes, and $15-$25 once you’ve got the hang of things. Time taken to make $100: 10 hours as a newbie, 7-4 hours when more experienced. Similar to DoorDash, Instacart is a great way to make some extra spending money by delivering groceries and shopping for others. Who doesn’t love spending other people’s money, am I right? Working for Instacart you can expect to earn between $10-$15 per hour, but that can vary depending on order total and tips earned. Time taken to make $100: 10 hours at $10, 7 hours at $15. Tip #1: It may be worth mentioning that with delivery apps like Instacart and DoorDash, you are not reimbursed for mileage, gas, or general wear and tear on your vehicle. Tip #2: A number of people have better luck using Postmates since it has better scheduling and more customers. If you’re wondering how to make $100 a day FAST, this one is for you. Be one of the many people who have signed up on Uber to drive people around. (Here’s a guide on how). It’s flexible (you’re your own boss), you get paid almost instantly (you can cash out a few times per day), and if you’re sociable you’ll love meeting all the new people. Cons are that you’ll be probably be working during times most people are not, and you’ll also be using your own gas and your car will suffer from wear and tear over time. But can you make $100 a day with Uber? If you’re clever about who you decide to pick up and where you drive, you can definitely earn $100 a day as an Uber driver. If Uber isn’t your thing (or not available where you are) you can also try checking out Lyft (drivers can receive tips) or Bolt (formerly known as “Taxify”). Time taken to make $100: about 6 hours. Uber also offers the option to earn extra money on evenings and weekends with Uber Eats. Deliver food to people using either your car or your bike. You need to be 18 years old though (other places state 19 years old) and possess a valid ID. A word of wisdom though: know that with Uber Eats you have to wait for the order to be made, keep the food warm and looking presentable, get out of your car and wait for the customer to answer their door. Also, you may get complaints if the food is not to their liking. As a regular Uber driver, you drop people off without even having to get out of your car or wait for anybody else. Uber Eats is a decent alternative (especially on evenings), but it won’t earn you money as fast as being a regular Uber driver. If you’re outside the US (and especially if you live in the UK), you may also want to try delivering with Deliveroo. Time taken to make $100: about 10 hours. If you like finding information and answering questions I recommend you try Answeree.com. At Answeree.com you will receive 10 points or $0.10 USD for each question that you answer, and if your answer has the highest number of likes, you can receive additional points or $0.01 USD per like. You won’t be able to cash out until you reach $30 USD. The mission at Experts123.com is to help people find information and answers. If you have knowledge or expertise in your field, or just certain knowledge of your hobbies and interest, you can contribute on Experts123.com. And most importantly is the range of pay, which I’m sure you’re dying to ask. On Experts123.com you can expect to receive between $10-$20 per article written. Articles to make $100: 10 at $10 per article, 5 at $20 per article. While you’re working on all that research, writing articles, and answering questions, why not cash in on your internet searches, too? Using Swagbucks, you will be able to answer surveys, watch videos, shop online, and receive gift cards to your favorite stores and restaurants in return! What if I told you that you could make money by losing weight? Well, you can! Healthy Wage is essentially placing a bet on how much weight you can lose in the timeframe that you choose, and by working out and getting fit, you can win a prize of up to $10,000 according to their website. It’s proven that by committing to losing weight with money helps keep people motivated to lose…well, lose weight that is. Healthy Wage also offers an affiliate program that pays you $50 for each HealthyWager sign up, or $30 for each Team Challenge participant that signs up. There is a small entry fee, but this is earned back if you can commit to your weight loss! Time taken to make $100: Depends on your bet. Tip: If you were put off by the entry fee, StickK is a similar website but does not charge an entry fee. If you’re a music lover wondering how to work towards making $100 a day, this tip is for you! With Slice The Pie, you can listen to unreleased new music by unsigned artists and give them your opinion. The more detailed the feedback—specific, constructive, etc.—the more you will gain a better reputation and get paid more. Once you reach $10 you can withdraw your earnings via PayPal. Each review will pay you from 2¢ to 20¢, but you’ll get paid more as your reputation increases. If you refer a friend, you’ll get paid a bit more for each review they submit. So, if this sounds like fun, then this is a GREAT hobby for those wanting to earn a bit more money on the side. You only need to be 13+ years old to sign up, so this is great for students wanting to earn a bit of extra cash. Reviews needed to make $100: 500 at 20¢. If you love animals, pet sitting is a great and flexible side hustle to make some extra cash. (It’s not literally sitting on people’s pets…but I probably didn’t need to tell you that). Predominantly a place for dogs, at Rover you can also look after cats, guinea pigs, and a lot more. You also set your own prices and schedule, so it really is quite practical! Time taken to make $100: Depends on your rates and what you offer. Did you know you can actually get paid to walk? While this is definitely not the quickest way to make $100 on this list, we thought you needed to know about Sweatcoin! Instead of just seeing walking as a means to get somewhere, or as a way to keep fit with those 10,000 steps per day to keep the calories at bay, why not also see walking as a small but consistent investment? Sweatcoin is an app that pays you a minuscule amount per step in a currency called “sweatcoin”, which you can then use to exchange for prizes or even real-life money. So if you want to make money while you walk, join Sweatcoin now. Got a spare room you don’t use or need? Consider converting it into a nice sleeping space for people to spend the night in. With the average Airbnb room bringing in $160.47 per day, this is great way to earn money on the side with little work! The main effort is making it presentable in the first place and cleaning it once the person leaves. But, apart from that, it’s practically easy money! Also great if you like meeting new people from all over. Time taken to make $100: about 1 night. If you live in a busy city, near a train station or airport, then your parking space could be used to earn some extra passive income. Obviously it will depend on your location as to how in demand your parking space will be, but it’s definitely worth listing your spare car parking spot as available and seeing what income it may generate for you! ParqEx will also let you rent out your garage if you sign up to their ACCESS+ program which allows people to open your garage door using an app on their phone. If you have a love of fashion, sharing, creating, and talking about clothes and accessories to create an amazing outfit, become a Stitch Fix Influencer. You can promote their website, style subscription box, and receive $25 each time someone signs up using your affiliate link. They also have job opportunities going too which includes work-from-home jobs, as well as jobs around the US and abroad. Welcome to the 21st Century internet version of good old fashioned market research. Respondent.io pays you on average $100 per hour to share your opinions. After signing up, you apply to give your opinion into specific projects you think are a good fit for yourself. And once reviewed, you’ll be invited to participate in a one-on-one interview for that study/project from a choice of times offered by the researcher. You don’t need to be a professional. All you need is a PayPal account, a LinkedIn or Facebook profile, and to be over 18 years of age. Time taken to make $100: 1 hour at $100. Filling out surveys online is a great way to earn some extra cash—it’s really not hard either. You can get paid the equivalent of a lunch sandwich bought in a city center for just 30 minutes of answering questions on surveys. To be clear, a lot of survey sites are pretty bad since some pay miserably. But there are some great ones out there if you know where to look. We’d recommend Survey Junkie, Swagbucks, or Inbox Dollars. (They all have “Great” safety ratings on Trustpilot). Survey Junkie will pay you an average of $1-$3 for surveys that literally take a few minutes to fill out. But you’ll be invited to complete about one survey per week. Still, for how little time it takes, it’s not bad. Probably a good idea though to sign up to Inbox Dollars and Swagbucks too. Filling out a typical survey on Swagbucks takes about 10 minutes but Swagbucks has the advantage of having all kinds of other ways to earn points (or “swagbucks”) such as playing games, browsing the internet, or clicking through Swagbucks to shop on sites such as Walmart or Amazon (at no extra cost to you, you’ll earn swagbucks on what you end up buying). Inbox Dollars is unique in that, unlike Survey Junkie and Swagbucks, they actually pay you directly in cash, meaning you won’t have to cash out via PayPal or redeem points for store gift cards. You can also earn money by watching videos with Inbox Dollars, and you also get $5 for signing up. This way won’t earn you $100 in one day, but it’ll help towards that. We reckon you could earn an extra $5 to $10 a day if you sign up to more than one site. Website designers/owners are always eager to know what people’s first impressions are when they visit a website. You can get paid around $20 for 20-minutes work testing a website on UserTesting. You’ll be checking out how the website works and if it’s designed well. The good thing about UserTesting is that you don’t even need a webcam to begin testing sites. Time taken to make $100: 1 hour for three 20-minute jobs at $20. Top websites like Google need to make sure their search engines are as effective as can be. Appen search engine evaluators can expect to make between $13-$15 hourly; they also offer lots of small jobs including translation and data entry. Time taken to make $100: 8 hours at $13, 7 hours at $15. Online search engine evaluators are needed desperately by websites like iSoftStone that offer work-from-home jobs or jobs in fixed locations worldwide that make sure their search engines are optimized and effective. Pay is around $11 an hour. Time taken to make $100: 10 hours at $11. I know this might sound intimidating, but working as an Amazon Mechanical Turk Worker, you can get paid to process photos and videos, perform small data entry tasks, translations, making transcriptions of audios, removing duplicate content from listings, and more! The average person reports receiving around $6 to $10 per hour this way. Not bad for some work on the side! Time taken to make $100: 17 hours at $6, 10 hours at $10. You can work virtually for Amazon as a customer service representative assisting customers with questions, orders, complaints, and more remotely if you enjoy talking and working with people. You can expect to earn around $11 per hour. Some of these virtual positions may require you to be based in certain states. If you love working with people, are good at listening, troubleshooting, and providing support, you can make extra money providing tech support for Apple with a range between $11-$16 per hour. Home advisors can look forward to receiving product discounts and career opportunities within the company. Time taken to make $100: 10 hours at $11, 7 hours at $16. If you like teaching and like working with kids you can earn between $16-$20 an hour teaching English to children according to the QKids website. Through QKids, there are opportunities to receive loyalty bonuses and an increase in pay based on performance. Teachers with QKids can expect to work between 10-20 hours per week and the only requirement for applicants is to have a bachelor’s degree. Time taken to make $100: 7 hours at $16, 5 hours at $20. Another online teaching English opportunity, VIPKid boasts a salary of up to $22 per hour for online English tutors. An average salary is around $18 per hour. As a teacher with VIPKid, you will be teaching Chinese students who are learning English. Additionally, you can earn referral bonuses, performance bonuses, and additional work hours and students. If you decide to apply and start working for VIPKid, you will be signed up for a 6-month contract which can be renewed. Like QKid, they also ask for a bachelor’s degree. Time taken to make $100: 6 hours at $18, 5 hours at $22. Working as a virtual assistant may have you thinking that you’ll be having to answer calls, but not all virtual Assistant positions require talking on the phone and answering calls. Startups.co has remote virtual assistant positions posted from start-up companies in the U.S. with a salary between $13-$18 per hour. One requirement for applicants is that you hold at least an associate’s degree. Time taken to make $100: 8 hours at $13, 6 hours at $18. Posting positions in the U.S., Timeetc looks for virtual assistants at an hourly rate between $11-$16. They ask for five years of work experience, be based in the U.S., have daytime availability, and that you purchase and maintain Professional Liability Insurance which is something to take into consideration as the starting salary is $11 per hour. Worldwide101 is a great opportunity to find full-time, long term work as they ask what your long term and short term goals are. They publish positions from the U.S. and U.K. and the pay ranges between $15-$20 per hour. One of the requirements for applying is an up-to-date and current LinkedIn profile. Time taken to make $100: 7 hours at $15, 5 hours at $20. If you have bookkeeping and accounting experience, Accounting Department is an excellent opportunity for accounting professionals who are wondering how to make $100 a day from home (or even more). Their one requirement is that you have at least three years of bookkeeping experience. Time taken to make $100: Depends on the job. This job will require a bit more experience and equipment, but if you have experience making transcripts and transcribing audios, 1-888-Type-It-Up is well worth the money. Experienced transcribers can expect to receive between $30-$180 per hour, whereas less experienced may receive between $20-$160 per hour. Some of the stipulations include an entrance exam fee of $39, maintaining a subscription of Microsoft Office, having headphones, and a Google account. Time taken to make $100: 5 hours at $20, 1 hour at $160. If you don’t happen to have any experience with transcribing, an excellent opportunity to start making money transcribing is Literably where you’ll be listening to and scoring students who are performing out loud reading exercises. While listening to their readings, you’ll be transcribing their answers. You’ll earn from as little to $10 per hour to, at most, $20 per hour. Time taken to make $100: 10 hours at $10, 5 hours at $20. If you love writing, then you can easily make money by writing articles and blog posts as a freelance writer. Verblio offers writers a range between $8 and up to $72 depending on quality of the writing and experience. As a writer, you will submit your pieces and clients can choose to purchase it or make requests for written content. Articles needed to make $100: 13 at $8, 2 at $72. Hirewriters.com is an excellent opportunity for beginner writers as it doesn’t require a membership fee. You can start with small articles beginning with 300-400 words (as a beginner you’d only get paid about $2.25, but about $10.50 when more experienced) until you get more comfortable writing and can take on bigger articles. There is also the opportunity for writers to receive bonuses from clients for their work. Not great money but useful to get used to the concept of freelance writing. 300-word articles needed to make $100: 45 as a beginner, 10 as an experienced writer. If you want to become a proofreader and editor, Cactus Communications doesn’t require loads of experience like other proofreading and editing websites which may require a Ph.D. in English, so it’s a great place to start. They also offer telecommute and freelance positions in fields such as marketing, customer service, translations, and more. The positions are mostly full-time work and they don’t pay much, but they can be a reasonable means of income when in-between jobs, or during your summer break when not studying or working. There are so many other work-from-home opportunities that I can’t even mention in just one article. And luckily, there are websites devoted to finding all kinds of remote work! Remote work is great since you can do it anywhere and have more flexibility to work it around your schedule. So if you’re looking for some extra cash on the side, then I recommend signing up and checking out these websites. Believe that some of your talents could be taught effectively as an online course? Your experiences and talents may be desperately desired by someone else. Why not create an online course with modules, videos and notes that teach people how to do what you do? Here are just some general skills/topics that could easily be narrowed down into more niche online courses: Photography, Cooking & Recipes, Writing, Blogging, E-commerce, Healthy Living, Science, Math, History, Self Help, Learning A Language, Handwriting, Culture, Art, Theology & Philosophy…Take your pick! Teachable is super flexible since it lets you offer courses on your own website, meaning you can control your branding and pricing and get access to your students in one place. They offer a Free plan, a Basic plan ($39 per month), a Professional plan ($99 per month), and a Business plan ($499 per month). You can also claim a free spot to their webinar which will teach you how to set up and launch your own course quickly. While not as easy to use and more difficult to set up, Thinkific offers better customization as well as zero transaction fees on whatever plan you choose. Their plans are priced very similarly to Teachable’s tiers mentioned above: a Free plan, a Basic plan ($49 per month), a Pro plan ($99 per month), and a Premier plan ($499 per month). While you’re running all those errands on Instacart and DoorDash (mentioned as a way to make money at the beginning of the article), cash in on those receipts using the Ibotta app. This app allows you to search for rebates on products you purchase in-store or online. Ibotta offers a wide variety of stores and, depending on your regional area, can offer local stores as well. You can cash out once you reach $20, you can choose to receive your cash via PayPal, Venmo, or as a gift card to your favorite stores and restaurants. To maximize your profit, you can also receive referral bonuses if you tell your friends. Similar to Ibotta, Checkout51 is a downloadable app where you can find rebates on products like groceries, clothing, gadgets, and take a photo of your receipts once you’ve come home from a long day of shopping or running errands. You can withdraw your earned cash via PayPal, Venmo, or gift cards to your favorite places. Starting a blog changed me and my husband’s lives. Although we’ve not technically included this in our official list above, we had to mention this since we talked in our introduction about how this has changed our lives. We quickly started hosting a website with Bluehost (if you click on this link I will receive a commission at no extra cost to you. This helps me keep Chasing Foxes running). Read this simple guide here if you need some guidance setting up Bluehost. We then purchased a cheap WordPress theme to make our site look pretty. Meanwhile, we’d made a Pinterest account and had started joining group boards so the pins we made linking to our site would reach more people (more on that step here). We also learned how to do much of this from the information we learned in a course called Elite Blog Academy which was really useful (my full review of the course can be read here). And we actually ended up making $19,000 in our 8th month blogging. So we then started to focus on getting our articles ranking well on Google too. So we learned how to do SEO (Search Engine Optimization) by taking this course called Stupid Simple SEO by SEO-expert, Mike Pearson (my full review of this course can be read here). To this day most of our traffic predominantly comes from Pinterest, but more and more is now coming from Google too. Since 2016 this is how we’ve been making our full-time living. It’s been hard work and has taken some time, but it’s been totally worth it. And there’s literally no reason why this couldn’t work for you too. At least starting out as a side hustle, but one day becoming your full-time job! Go for it! So these are just 40 ways you can make $100 per day, but there are more. Be creative and figure out what works best for you! And if you know of other great ways to make $100 a day online or from home, then please let us know in the comments below.